What is the relationship between time perceived in a dream and time in the external world? Is time running in dreams always faster than the time running in the real world? Is it ratio of real time and dream's time? In experiments conducted in the 1950's, William C. Dement, a pioneer sleep researcher, asked subjects to write down their dream content. What he found was that the number of words in the subjects' dream diaries correlated strongly with REM time, suggesting that perceived dream time matches actual dream time. Although REM time is no longer considered a reliable measure of dream time, this paradigm of using Total Word Count (TWC) or sometimes Total Recall Count (TRC) from dream diaries (referred to as sleep mentation reports) to measure dream length, is in common use today. Further validation of this method was found in subjects with RBD, a disorder that features twitching and movements during sleep, and other parasomnias such as sleep talking. Here, timings in dream reports match recorded timings of muscle movements and sleep talking. In other experiments, external stimuli delivered during dreaming - such as sounds, smells, or touch - are incorporated into dream content, again with timings matching reports. More recent research by Matthew Wilson focusing on memory consolidation in dreams adds an important detail to this however. Dream sequences are often disjointed, on a faster time-scale, and sometimes in reverse order with respect to the events they reflect. Think of it this way: If you watch a video in fast-forward (ie, skipping frames), then the time in the video is faster than real-time, but you are nonetheless aware that you have been watching for a shorter period of time. The same appears to be true of dreaming: Dreams may play in fast-forward (also skipping frames), but dreamers are nonetheless aware of the actual passage of time. In the experiments with rats traversing a maze for example, dream imagery reflected important points in the maze, such as major intersections, areas with unique smells, obstacles, etc, rather than long boring monotonous hallways. Think of it like a tourist taking photos of a hiking trail: The photos are not evenly spaced out in time - there are fewer photos from boring parts of the trail, and more photos from the interesting parts. That is, dream content does not necessarily play at a constant speed relative to real-time - it may be faster (skip frames) or slower (add frames), and change over the course of each dream. Note: Dreams are typically 30 minutes or less in length. I would like to bring up that there is also an opposite study about sleep duration than described in the previous answer. Daniel Erlacher at the University of Bern conducted an experiment to analyze brain activity during a lucid sleep. 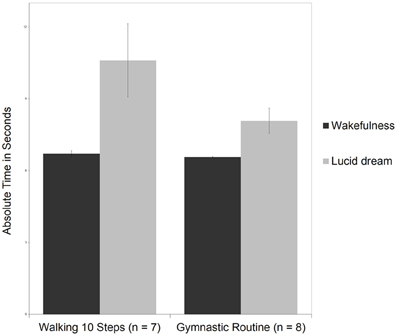 When he asked subjects to complete an activity, it took 50% longer to perform it in lucid sleep than in real life. This could explain why many people see dreams of running in slow motion. Perceived dream time can be much greater than actual dream time. Once every few months I will wake up early in the morning, go back to sleep and have a lucid dream. Every single time, I become convinced that I have been dreaming for hours, panic about being late for work, go through a series of false awakenings and become increasingly frustrated at my inability to wake up for real. When I finally wake up, I check the clock and always find that I have been asleep for less than fifteen minutes. Not the answer you're looking for? Browse other questions tagged sleep dreams or ask your own question. While dreaming, are memories replayed faster or slower? Can the brain create it's own artificial time? What causes dreamers to accept dreams as reality? Why past events reappear in dreams after a certain delay? why we forget dreams when we wake up?